By a / September 13, 1998 / . Scenes from the life of Andy Warhol, Jonas Mekas, 1965-1982, 16mm, 38 min. Velvet Underground and Nico’s first public performance. The Factory, George Maciunas’ dumpling party. Cast includes Lou Reed, Edie Sedgwick, Allen Ginsberg, John Lennon, Yoko Ono, Paul Morrissey, Peter Beard, Caroline Kennedy, Mick Jagger, Barbara Rubin. 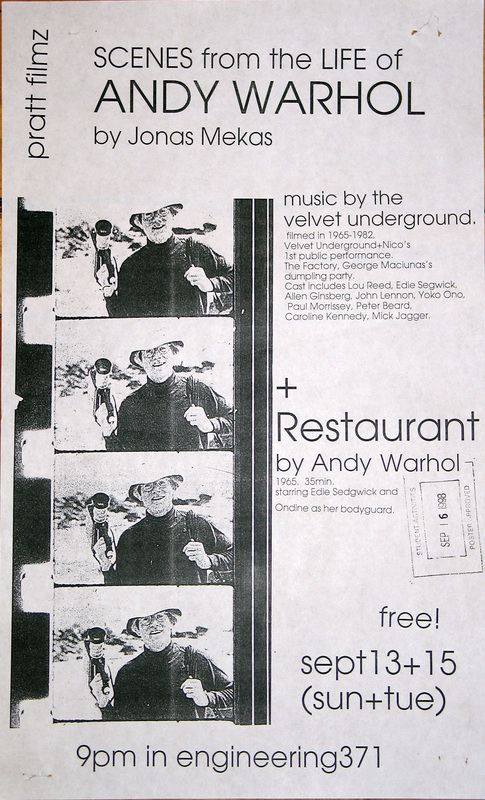 Restaurant, Andy Warhol, 1965, 16mm, 35 min. Starring Edie Sedgwick and Ondine as her bodyguard.